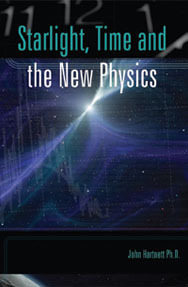 TRUTH MATTERS » Blog Archive » Dark Matter and Dark Energy Not Needed After All? OUR GALAXY AT THE CENTER OF THE UNIVERSE? This means we are located at the centre of concentric great spherical shells, on which the galaxies themselves are located, that seem to be equally spaced with a separation of about one hundred million light-years. In other words, Hartnett has found evidence that the universe has a center and our galaxy is located close to this center. See Chapter 5 of his book. … my interpretation is that we are seeing the creation process in the heavens as it was happening on Day 4 of Creation Week. We are seeing creation as it happens! On p. 103, Hartnett states his belief that “the initial radius of the universe was about 8 million light years (possibly less) before God stretched out the heavens on Day 4 of Creation Week. This indicates that galaxies were initially created much closer to Earth, and that God expanded out the space, dragging them apart. And as that occurred, new material–additional galaxies, quasars, etc–was created like one of those fireworks displays where we see the exploding embers from the parent explosion in a chain reaction sequence.” Hartnett shows that the Carmeli-Hartnett model solves the problem of distant starlight in a young universe. Dr. Hartnett has published more than 120 papers in scientific journals and holds 2 patents. His work in the ongoing development of new physics has attracted the interest, and funding, of his university — the Univ of Western Australia. This entry was posted on Saturday, November 19th, 2011 at 7:20 pm and is filed under Creation/Evolution. You can follow any responses to this entry through the RSS 2.0 feed. Responses are currently closed, but you can trackback from your own site.